Social media is finding little to like about the likeness on a plaque honoring retired soccer champion Brandi Chastain. Damian Trujillo reports. 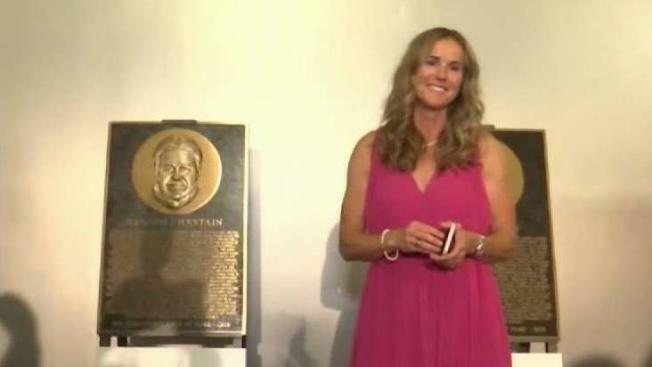 Social media is finding little to like about the likeness on a plaque honoring retired soccer champion Brandi Chastain. The Bay Area Sports Hall of Fame in San Francisco unveiled the plaque on Monday night. Chastain diplomatically said "it's not the most flattering. But it's nice." Kevin O'Brien, Bay Area Sports Hall of Fame president, said he is not happy with the plaque. On Tuesday, the agency asked Chastain for another picture so they can order a new one to display at San Francisco International Airport. "It's not exactly what you hope for when you talk about who it is you look like," Chastain said. "Those would not be the images that I would have expected. But I'm not an artist." Chastain also added: "To me this is no blemish on them." On Twitter, fans compared the likeness to former President Jimmy Carter or actor Gary Busey. O'Brien said the plaque would be done in 3-5 months and it costs about $8,000 to $10,000 to make. Chastain said she was surprised at the plaque but it should not take away from the good work of the Hall of Fame. What's more important is the non-profit work that the Bay Area Sports Hall of Fame does, Chastain said. "To me, that's the overarching thing of the night," she said. "That we have great athletes that get a lot of attention and there's millions of kids in our community that need our help." Chastain is often remembered for ripping off her jersey and showing her sports bra after nailing the game-winning penalty kick in the 1999 World Cup. Another soccer legend was recently honored with an odd-looking piece of art. In March 2017, an airport in the hometown of Portuguese star Cristiano Ronaldo put up a bust showing him with something of a smushed face, though the player didn't make note of it when the statue was unveiled.